I'm doing a little spring cleaning - on my nails! Today I'm sharing the palette cleansing collection of the OPI SoftShades. These stray far away from the neons and brights that summer promises, but I personally welcome the change. This little collection has 6 shades that all complement even the least daring lady, with neutral pinks and whites. For the more out-there wear, there are a few glitters. My favorite shade is Act Your Beige!, so I chose it for nail art. Only, it didn't need much. I didn't want to cover it because it's so pretty, so I just popped a few rhinestones and microbeads onto a few nails, and this stunning design came through. I did 3 coats of Act Your Beige! because I like a milky finish. The rhinestones I used come from a few places, like Born Pretty Store. Here's a little more side detail on the rhinestone stack. Let's take a look at the SoftShades colors on their own, starting with one of the glitters. Petal Soft (1 coat over Act Your Beige!) is a sweet spring glitter mix. The glitter is all matte, so there's no shine to the pieces. The clear base supports light pink and white hexs, as well as daisy-shaped white glitter. I used this on a darker pink earlier this month, and it popped beautifully! Act Your Beige! (3 coats) is my favorite, as I mentioned. It's a cool, milky soft baby pink. On my natural nails, it looks like I paid for a set of pink and white acrylic, but it blends better than any acrylic master could ever hope to achieve. I've also been using Chiffon My Mind (2 coats) a lot, which is a cool off-white crelly with blue iridescence throughout the base. You can see what I'm talking about on my ring and pinky fingers best. It's a little chalky because it's more opaque, but not unmanageable at all. Another glitter in SoftShades is Make Light of the Situation (3 coats) - a barely pink, mostly silver glitter mix. It's quite dense, though still provides a sheer coverage that's probably best over another light color. Put it in Neutral (3 coats) provides a nice milky coverage as a darker, warmer pink than Act Your Beige! It's more of a sheer blush. 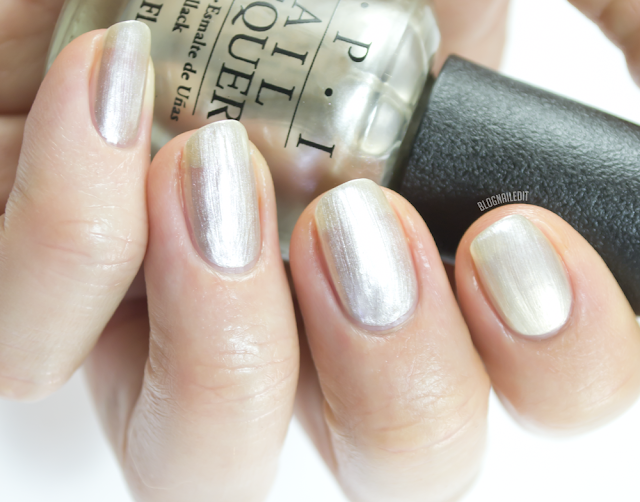 OPI - This Silver's Mine! Finally, This Silver's Mine! (2 coats), which I absolutely hate. This white-silver metallic is streaky and patchy, and the formula reminds me of cheap polishes I used to buy years ago. It's just not great, in my opinion. How would you work nail art into this collection, or would you keep things simple with some sort of French? SoftShades is available now at ULTA, ULTA.com, and select professional salons as lacquer, gel, and as part of nail art kits that include Swarovski crystals! this shade is much to sheer for my tastes but I love the first photo of the nail art with the rhinestones a beauitful combo!